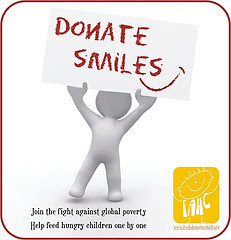 Indian Food Rocks: ChipIn to Donate Smiles! and win prizes! Thanks for your participation, Manisha. hey manisha!!! incredibly said, hope we can reach our goal by 23rd!! Manisha, wonderful prizes!..really very nice of you. hey manisha! well said and nice prizes. i can't see how anyone with a little daughter could pass up those. they are adorable. Manisha, its really great seeing everyone getting together for this cause. And even more heatening to see the collections grow.....hope we can make it by the 23rd. and those are cute saris! Thanks a lot! Yes, those sarees are adorable! 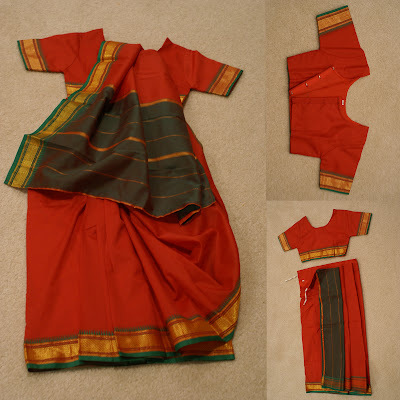 And just right for the festival season - Navratri as well as Diwali. Nandu, welcome! 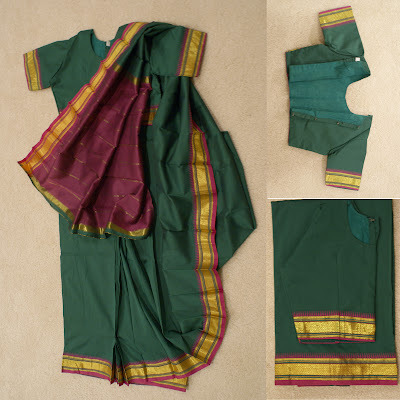 Please consider donating to FAHC and bidding for one of these sarees in the raffle. Are you concerned about the size? The blouse can be altered and by tomorrow, I can measure the length of the petticoat and update my post with that info. Very kind of you to help with this project, and to donate such beautiful pieces of clothing! I am quite sure that the goal will be met! Manisha, Hello from San Francisco! Charlotte and I just had dinner with our friend Mimi, who we are staying with. We finished up with ice cream at Bombay Ice Cream - a must on every trip here. It was the perfect chance to tell them about this project and we have each just made a donation through PayPal. We are all curious about what the food kits contain. Do you know? Thanks for talking about the project in you blog. Lee, Charlotte and Mimi, hugs to you all and thank you very much for your donation! The food kits contain rice, dals, oil, sugar, fruits and milk. Click through to see the quantities. If you're eligible for a raffle ticket, please forward your PayPal receipt to donatesmiles@gmail.com stating which prize you would like to entered for. Every $25 buys a raffle ticket for the drawing.